Los Angeles, CA (The Hollywood Times) 2/9/19 – Held in the Clive Davis Theater inside GRAMMY Museum® LA, “A Night on the River” successfully kicked off GRAMMY® Week on a musical high note. Last night’s event marked the 10th anniversary of Mississippi Night, a celebration meant to honor the year’s GRAMMY® nominees as well as pay homage to the state’s unique cultural legacy. Acting as an appetizer before the big show’s live taping this Sunday, performances included GRAMMY® nominees hailing from the state of Mississippi, the city of Memphis, and the state of Louisiana. 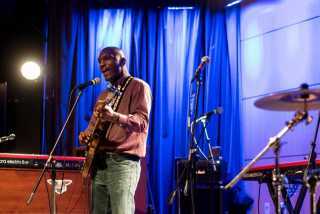 Cedric Burnside (‘Best Traditional Blues Album’), Hi Rhythm Section (‘Best Contemporary Blues Album’), Doe (‘Best Gospel Performance/Song’), PJ Morton (‘Best Pop Duo/Group Performance’, ‘Best R&B Performance’, ‘Best Traditional R&B Performance’, and ‘Best R&B Album’), Sean Ardoin (‘Best American Roots Performance’ and ‘Best Regional Roots Music Album’), and Cha Wa (‘Best Regional Roots Music Album’) all took the stage. The featured performer of the evening was country artist Randy Houser who was interviewed by GRAMMY Museum® Executive Director Bob Santelli prior to his set. Ward Emling, former director of the Mississippi Film Office, claimed the title of the night’s Master of Ceremonies. An after party catered by Louisiana Seafood was held on the top floor of the museum overlooking the streets of Downtown Los Angeles. Tasty treats included mini crawfish pies and fried catfish. DMI All Stars lent their vocal talents to the party’s soundtrack ensuring a lively time for all guests in attendance. “A Night on the River,” is sponsored in partnership by Visit Mississippi/Mississippi Development Authority, Memphis Tourism, Louisiana Office of Tourism, GRAMMY Museum® Mississippi and the Mississippi Blues Foundation. The 61st GRAMMY Awards® will air live on CBS on Sunday, February 10th at 8PM ET/5PM PT.